Online Time Clock for Payroll and Time Off. With Mobile Employees Will Love. Timesheets.com provides an easy-to-use online time clock service for employees and other workers. Use our timesheets to track payroll, billing, or job costing. View real-time information and run detailed reports, all from the cloud. Incorporate electronic signatures and supervisor approvals. If you're calculating overtime or time off accruals, you'll be able to customize user settings on a per employee basis. Timesheets.com simplifies time tracking by providing an easy-to-use online timesheet for your employees. You'll finally feel like you're in control. See what time people got in, who's on leave, and view other real-time information right on the Dashboard. We simplify the payroll process by providing you with a final payroll report that has everything you need to pay employees and contractors. Timesheets.com offers many ways to track time for billing, job costing and productivity. Whether your employees are entering a straight 8-hour shift or working on 30 projects a day, our simple interface has you covered. You'll have plenty of granularity in your reporting which can be exported to accounting software for invoicing or downloaded as a PDF or spreadsheet. Timesheets.com's customizable user permission settings offer flexibility without sacrificing security. Tools like IP locking can help eliminate time theft while our timesheet's approval process means you can assume work time is ready for processing. We also have a comprehensive audit trail keeping track of all changes made to your timesheets. Timesheets.com offers multiple ways to enter time onto timesheets so employees can record data the way they want to - or the way you want them to. As a result, your data will be more accurate. 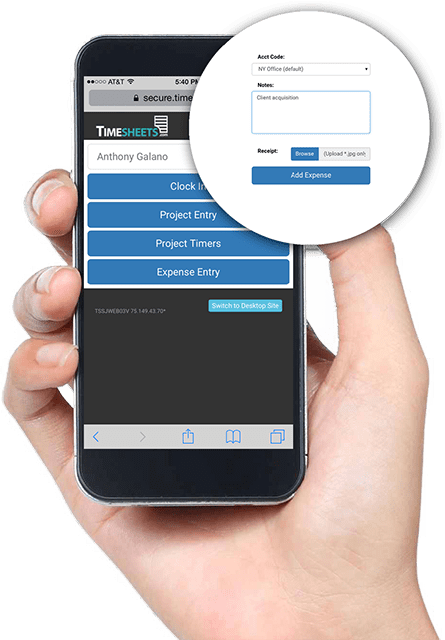 Workers can punch the clock, make individual time tracking entries daily, track jobs in real time using our timers feature, or fill in their timesheet at the end of the week. Whether your people use desktops, tablets, or mobile devices, we've got your covered. Track employee attendance on mobile with confidence. GPS tracking records the location of employees who work in the field. You and your managers can run reports and see all employees’ location data integrated nicely with Google maps. If you don’t want your employees clocking in and out from their phones, that's no problem either. Our service can be locked by IP address or used with our photo timestamp feature. The best way to protect your business from labor disputes is by having a proven process for employee requests and supervisor approvals. That's where Timesheets.com provides tremendous value. Our process is designed to be flexible while protecting your interests. In addition to our request and approval process, we document everything in an easily accessible audit trail.